Astronaut Chris Hadfield is embarking on another mission around the planet. This time however, he is not heading into outer space, but instead sharing "An Astronaut's Guide to Life on Earth." Hadfield, who was the first Canadian to walk in space and command the International Space Station, is launching on a four-country, three-month tour to promote the release of his first book. In "An Astronaut's Guide to Life on Earth," Hadfield recounts what his three missions and 166 days in orbit taught him about "ingenuity, determination and being prepared for anything," as his memoirs' subtitle reads. Five and a half months after returning from his stay on the space station, Hadfield will launch his book tour by landing in Toronto for an evening discussion at the Canadian retail bookstore chain Indigo. Beginning at 7 p.m. EDT, Hadfield will talk about "how to think like an astronaut" with Indigo "Chief Booklover" Heather Reisman, before sitting down to autograph copies of his book. Hadfield's first U.S. book tour stop follows Friday (Nov. 1), as he takes to the stage at Barnes & Noble Booksellers in New York City's Union Square for a similar public talk with PBS NewsHour science correspondent and veteran space journalist Miles O'Brien. The 7 p.m. EDT event includes a book signing. Hadfield's tour trajectory then takes him across the United States. He'll visit the Smithsonian National Air and Space Museum in Washington, D.C. on Saturday (Nov. 2), before returning to his former home of Houston, where he trained as an astronaut at NASA's Johnson Space Center. On Nov. 5, Hadfield will meet with space program workers, as well as the surrounding community during three signing events. From Texas, Hadfield will head to Chicago on Nov. 6, prior to reaching the west coast two days later for the Bay Area Science Festival. In another evening conversation event, this time with Adam Savage of "Mythbusters" fame, Chris Hadfield will speak and sign at the NASA Ames Research Center in Mountain View, California. The 7 p.m. PDT talk is sold out, although a limited number of standing-room-only tickets may be made available closer to the date. From Nov. 9 through 12, Hadfield will sign books in San Francisco Bay, Los Angeles and Seattle, the latter as part of the Seattle Science Lectures, sponsored by Microsoft and presented in part by The Museum of Flight. Hadfield will then head home, visiting a string of Canadian book stores through the beginning of December. Highlights for this leg include a Nov. 28 evening presentation at the Rose Theatre Brampton, a Dec. 8 brunch at King Edward Hotel in Toronto as part of Globe & Mail and Ben McNally Books' authors series and a Dec. 9 on-stage interview with broadcaster Valerie Pringle at the Toronto Public Library. The book tour then crosses overseas, where Hadfield will visit the United Kingdom and Ireland. According to Hadfield's publishers, the details for many of the planned signings in England and Wales are still being finalized, though he's scheduled for a Dec. 13 event at the National Space Centre in Leicester, and a Dec. 16 public appearance at the Science Museum in London. "An Astronaut's Guide to Life on Earth," which will also be released as an unabridged audiobook and an ebook, is the first of two titles by Hadfield. The retired astronaut is also working on a book for children with author, illustrator and FableVision founder Peter Reynolds. 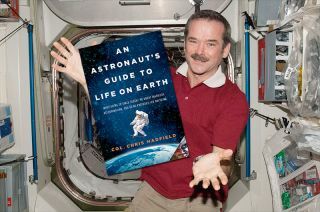 For more about these events, as well as an up-to-date list of where Chris Hadfield will be autographing copies of "An Astronaut's Guide to Life on Earth," see Sightings, collectSPACE's astronaut and cosmonaut appearance calendar.